Evil Factory from Nexon M is an action adventure mobile game that puts you in charge of Leo, a hero who’s being trained by the International Alliance. The goal: train you until you’re ready to face the Kraken, an evil organization bent on taking over the world. The game starts with a tutorial that will immerse you in the game, and what an experience it is. 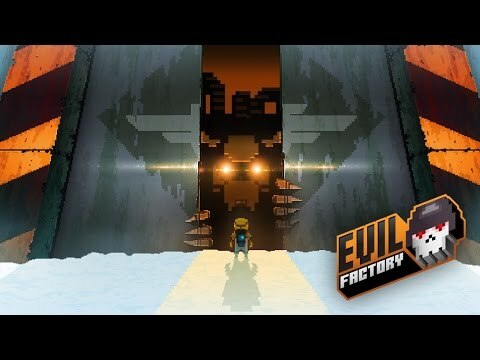 One of the first things you’ll notice about Evil Factory is that all your enemies have a boss-like appearance. Yes they’re big, but you’ve got explosives and a flamethrower so you’re not helpless. Basically you’ll be moving around levels, trying not to get hit and setting up explosives to take down the enemy. You can also upgrade your weapon as you advance in the game. There is a virtual joystick to control your actions, and since the thumb stick follows you, you’ll never have to look for it. The key to successfully defeating your enemies is moving around quickly but knowing when to slow down as well. You’ve also got a sub weapon, but learn to use that only when it’s needed to advance. You’ll need fuel to complete a level, but it regenerates as you play so there’s no need to buy the IAPs. You should also collect those gold coins as they’ll be needed for weapons upgrades. Again you’ll come across the gold and blue coins as you play so your patience will be rewarded. Lastly, Evil Factory has some of the best looking 88 bit graphics on mobile, so that’s another incentive to play.